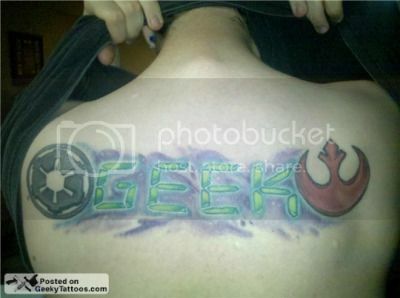 In a fit of redundancy, a guy named George got a couple of big Star Wars tattoos on his back, and then emblazoned “GEEK” between them. You know… in case there was any confusion. Via Geeky Tattoos, who gets the message loud and clear. It’s such a shame that so many poorly executed tattoos get so much attention. It’s Geek Pride, Snark. REPRESENT.